In January 1926, the lot on the southeast corner of 12th and Main was sold to Ernest E. Sprague, who promised to build a new movie palace. The artist who decorated the theatre, W.L. Hout, had recently completed decorating a theatre in Boulder, Colorado, and had created the decor in Denver's Jewel and Egyptian Theatres. A vertical Sherman electric marquee sign was installed July 15, 1926. Jens Jensen was contractor and building's cost was estimated at $50,000. Grand Opening was held August 2, 1926. The drinking fountain was mirrored, lighted and trimmed with hammered copper. The first feature film was a silent one called "Tramp, Tramp, Tramp", starring Harry Langdon. A pipe organ provided music. Tile mosaic at the exit door on the lobby's north side next to the balcony stairs is a remnant of the original building design. Only two years later, the theatre burned. Early in the morning of January 21, 1928, a fire destroyed the stage end of the building. Because of the early hour, the fire was initially undiscovered. It burned through the east wall of the theatre. The wall and roof collapsed into the alley. Although fire was quickly controlled, the damage was extensive. The heating system was blamed for the fire. Sprague vowed to rebuild the theatre in a more spectacular fashion. Theatre reopened April 23, 1928. The pipe organ had been replaced by a phonograph and a new heating system had been installed. New artwork was painted on the walls. In March 1929, the theatre was retrofitted for movies with sound, or "talkies". The theatre had an orchestra pit where the pipe organ was located and an elaborate proscenium arch. "The Trail of '98", a film about the Alaskan Gold Rush starring Dolores Del Rio, and a musical short starring Eddie Cantor, were the first talking picture shows. Sprague had installed Western Electric sound equipment. April 10 was the first billing of all-talking shows, but for several weeks the theatre showed half silent, half talking shows. In April 1929, Kansas Governor Clyde Reed decided to close business on Sunday unless they were "necessary for humanitarian or charitable reasons." 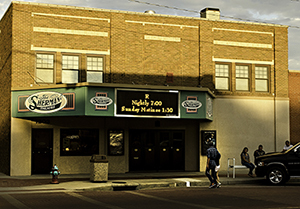 Sprague announced that as long as movies played in Kansas City, they would play in Goodland. By May, Reed had dropped the issue. Complaints about the sound system reached such a pitch by July 1929 that the theatre threatened to "discontinue talking pictures" until sound systems improved. By 1930, the talkies had proven their permanence and Goodland was involved in making a movie called "Running Wild". The theatre showed the movie once it was completed. Theatre was also a venue for vaudeville performances and local artists. In 1947, the theatre underwent another remodeling. Then-owner Commonwealth Theatres installed a new marquee and RCA Photophone sound equipment on March 31 and April 1. 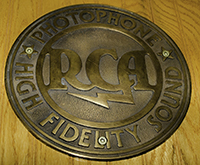 The current owner, David Branda, bought a Photophone brass casting on eBay in 2012 and hung it on the wall that separates lobby from auditorium. The balcony still retains the seating from this remodel. The ground level had love seats, which have since been removed. Balcony is usually closed for shows. Ask before going up there. Note the vintage styling on the seats. To accommodate the panoramic footage of 20th Century Fox's CinemaScope, in 1953 the theatre removed the proscenium arch and widened the stage. In 1968, the building's front completely changed. The marquee was expanded, lobby redone, new carpet laid and walls repainted. The concession stand and restrooms were remodeled. Original restrooms had contained one toilet and were upstairs. Branda bought the theatre November 9, 1990. He filled in the orchestra pit and extended the stage over it. He installed new heating, air conditioning and analog stereo sound. In 1994, he remodeled the front, marquee and lobby and in 1999 installed Dolby Digital sound. A Dolby plaque hangs on the wall dividing lobby and auditorium. Note the movie-themed lights on that wall. 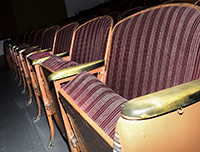 In 2003 he installed new seating and returned the front to its original state in 2007, installing new windows. The final night of film projection was February 28, 2010. Digital equipment made its debut March 5, 2010, with a 3D presentation. In 2008, Branda hired Laurie Albin to restore a mural from the 1928 remodeling and in 2013, he uncovered peacocks and roses from that remodeling. The lobby has two frames that contain articles of historical interest. One hangs near the entrance and displays vintage theatre photographs. The other hangs on the south wall near the restrooms and displays vintage theatre advertising. The theatre has regained many touches of its 1920s movie palace origins while staying up to date with current theatre technology. Show time usually begins at 7 p.m. Mountain Time. For more information and ticket pricing, see the theatre's website. Concessions and gift certificates are available in the lobby.